How Natural Cat’s Eye Differs From Heated, Treated Cat's Eye? Difference Between Natural And Heated Cat’s Eye Gemstone? What is the difference between natural cats eye gemstone and heated cat’s eye? Actually, this is a pertinent question in the field of Gemology. People out of unawareness, sometimes buy heated cat’s eye instead of a real cat’s eye gemstone. But mostly they ponder that why the significance of natural cat’s eye raked so high in comparison to heated cat’s eye? So, in this article, we would like to draw your attention to the basic difference that exists in between the natural cat’s eye and heated cat’s eye gemstone. A real or natural cat’s eye is the supreme quality of a cat’s eye. It attains the brilliant color, brightness and astrological properties which let it stand apart from the other grades of this gemstone. It is extremely hard to find a high-quality cat’s eye or lehsuniya gemstone because nowadays in order to fulfill the large demand of this stone gem seller are indulging in malicious practices to pull off the uprising demand. Nonetheless, the benefits which an original gemstone provides a synthetic or lab created gemstone can’t able to provide the same. Therefore, the position of a natural cat’s eye is unchallenged until now and its supremacy remains intact even under the continuous threat generated by the fake gem sellers. Apparently, a heat treated cat’s eye stone can’t be categorized under the category of the synthetic gemstone. 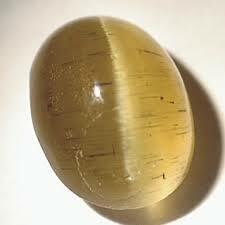 However, heating a cat’s eye will bruise the value or real properties of this stone. Hence, the value of a heated gemstone has been always lesser than the real cat’s eye. Heat treatment in cats eye gemstone means heating or melting a gemstone on a very high temperature to wash away all inimical or toxic elements from the stone. Although the heating process does have immense benefits yet, it subsides the overall value of a gemstone. It generally happens because during this process stone is heated upon intense temperature with the intention of discharging redundant materials from the stone and enhancing its appearance and overall quality. Nevertheless, melting gemstone on a very high temperature impel stone to leave its few significant attributes or properties that altogether lessen the impact or value of a stone. Rather than having less beneficial to a real cat’s eye still, people love wearing heat or treated gemstone because they look immensely attractive and their price is also low as compared to real stone. Most people buy treated or heated cat’s eye stone for the purpose of wearing them with rings, necklace, and pendants.